Japanese Episode DP 051: "Hikozaru vs. Zangoose! The Fateful Battle!!" American Episode 1050: "Glory Blaze!" While training for the second day of the Tag Battle tournament, Satoshi notices a pillar of fire coming from the distance. The young trainer rushes to the scene and discovers that the source of the blaze is Shinji's Hikozaru! The pokemon is being pushed to its limit by Shinji's harsh training, prompting Satoshi and step in and take Hikozaru to the Pokemon Center for some rest. Once there, Takeshi asks Shinji why he seems to train Hikozaru so much harder than his other pokemon. Shinji responds by telling everyone how the fire pokemon impressively defeated a herd of Zangoose on the day that they met and that his goal is to harness the power it displayed. Satoshi protests to Shinji putting his pokemon through such stressful training, but his tag partner doesn't seem to care until Joi steps in and orders him to let the pokemon rest. The next day, Takeshi, Honoka, Hikari, and Kouhei all make it to the next round. The final match is Satoshi and Shinji against a pair of trainers with a Metagross and a Zangoose. Satoshi chooses Pikachu while Shinji, ignoring Joi's orders, uses the still-recovering Hikozaru. 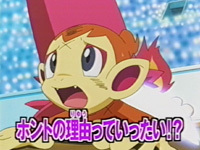 The fire-type monkey pokemon is frozen with fear at the other trainer's Zangoose, requiring Pikachu to have to step in to save it. At this point in the battle, Shinji turns his back on his pokemon, so Satoshi steps in and commands both pokemon to victory. After the battle, Shinji releases Hikozaru in an attempt to cut his losses. Satoshi, who had witnessed this scene, runs up to Hikozaru and offers it a slot on his team instead. Will Shinji's former pokemon accept Satoshi's invitation? To be continued! The Tag Battle arc is remembered because of the new trainers it brings in and for the great battles, but the part that really stands out about the arc is the whole Hikozaru storyline. The anime producers, exhibiting an unprecedented amount of foresight, shows us that they had actually been building up to the final scene of this episode ever since the very beginning of this series. I mean really...you can't ask for a better wrap-up to the series' first year than what we're given here. There really isn't too much to say about this episode because it's one of those that you really just sit back and absorb. It's not like other episodes where there are lots of little moments that you can list out as being awesome or funny or whatever; the whole thing is just great, from beginning to end. Yamaguchi Yuriko, who had been on maternity leave since "The Extraordinary Roserade and the Flower Legend! ", returns as of this episode. She provides the voice of Joi in the Japanese version. Something I noticed about the English version is that Paul actually seems a bit nicer than Shinji does. Now don't get me wrong - Paul still comes across as a colossal jerk in the dub. But there's just something about the Japanese version that makes the character seem a lot less likable than his English counterpart. I think it has to do with the fact that Shinji uses the most concise, rude speech patterns possible (especially when talking to his pokemon) while Paul simply sounds annoyed with everyone who keeps butting into his business. A few script changes would have helped bridge the gap better, but either way, the character's still a jerk. I also like how Pokémon USA kept in a lot of the Japanese background music in this one. A lot of key scenes had the potential to be mucked up by awful music cues but thankfully, that didn't really happen in this one. In the Japanese version, Kimi no Soba de ~Hikari no Teema~ (Winter Version) is used as the closing theme. Let's hear it for whoring out the same tired song over and over! Dawn: "Although it sounded like the better friends Pokémon and trainers are, the stronger they get, right?" Conway: "Yes! Precisely. See, you do get it. And remember...this applies to Contests, too." Dawn: "Friendship...that's the key. [looks at Piplup] We blushed!" Originally, Hikari blushed because Kouhei said that love is the key to becoming stronger, not friendship. So when Hikari and Potchama look at each other and blush, it's because they both felt kind of awkward about what Kouhei just said. I have no idea what they're supposed to be blushing about in the dub. Conway: "Of course, no matter how you look at it, Ash is the enemy." In the Japanese version, he actually says the opposite; that Satoshi and his tag partner aren't their enemies. It's kind of a weird thing to say since, for all intents and purposes, Satoshi is their enemy in the tournament, but maybe Kouhei is building up part of a bigger plot that'll come later. It's also entirely possible that it's just a random line that's meant to be ambiguous. Who knows? Narrator: "That was perfect timing between Chimchar and trainer. But the trainer was Ash! Turtwig's trainer!" Conway: "And it's breaking all the rules!" Everything in the Japanese version is the same except for Kouhei's line. Originally, he says that they really can't call the battle that they're watching a "tag battle" anymore. He doesn't say anything about the rules being broken. This change stood out to me because if what Conway had said is true, then Ash probably would have been disqualified. I mean, this is an official tournament and all. Our good friend Pokémon Symphonic Medley is heard in the Japanese version of this episode during the final showdown between the Pikachu and Hikozaru team and Zangoose. It's replaced by dub music for the English version.